It’s the small things that keep us grounded. I am fascinated by how the objects we surround ourselves with reflect our identities and values. I wrote about how this works on a cultural scale, from the perspective of a former archaeologist. But these dynamics are also intensely personal for me, and so today I want to elaborate on the backstory to one of my more popular cards. The short version: I was going to a lot of housewarmings, and was struck by how meaningful they were. 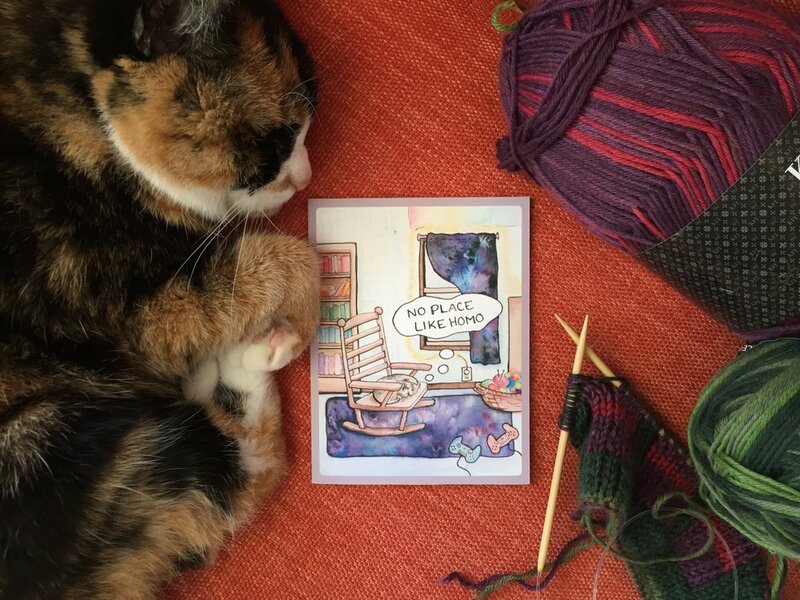 I wanted to make a card celebrating the ways we craft our homes into safe spaces, because so much of the world really isn't. Get a box set, make it a gift. Also? I think we should all be sending more "just because" cards. Let your people know they're special, and what an important part they play in making you feel truly at home. Because home isn't just a generic place we go. How we make a space *ours* varies from person to person, and it’s a strange dance between introducing objects and letting the space sink into our subconscious. As we affect the space, the space holds and shapes how we live. That’s not to say you need a large fancy space - quite the opposite. We are resilient, adaptable creatures, able to put down roots wherever we land. For those of us committed to creating new types of supportive communities, the creation of home is especially sacred. Even if you’re not overly concerned with design, thought and energy goes into shaping our nests into soft places to land. We can transform generic apartments into highly individualized spaces that are able to contain both the ecstatic delights and violent despairs that bookend the beautiful mundane spectrum of our lives. Here in Boston, September is moving month. More than half the people I know spent August packing up their lives, and have been working these past few months to shape new spaces into cozy homes. As we go into the holiday season, these spaces continue to evolve. How we prepare our space speaks to what we hold dear, and the kinds of traditions we want to hold on to, leave behind, or create anew. I am not a actually a great decorator. I have yet to hang all my art in my new(ish) apartment, and I am far too messy and depressed to not have piles of clothes on the floor. I dreamed of being an interior designer as a kid (and lived off of the TLC show Trading Spaces), but quickly learned that a highly designed space is not for me. What’s interesting, though, is that my spaces always feel like me. Through a mix of conscious adornment and subconscious sprawl, my external spaces end up reflecting various facets of my inner state. For those of us to whom it's accessible, the creation of a safe home is an important component of both self-care and community building. 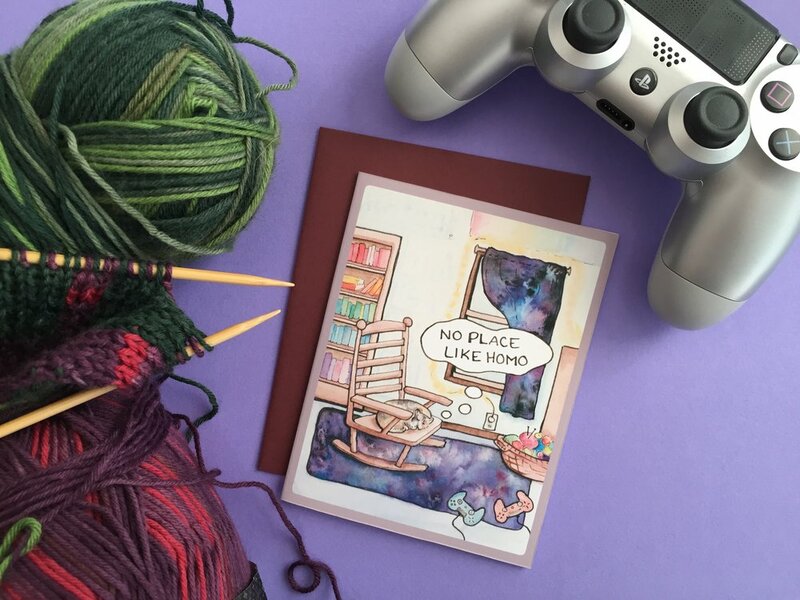 This card celebrates the ways we fashion our spaces to reflect personal identities and values, and in the process create a soft space to land for ourselves and for those close to us. Of course, home is not always where we live. Home is wherever you have space to breathe, and are held in community. And when it comes to community, there's no place like homo. Hey, have you signed up for my newsletter? You get a mini printable coloring book, more insight into my creative process, and of course the first scoop on all things Our Back Pockets. It's pretty awesome.